Author Tim...Posted on October 4, 2016 October 4, 2016 Categories OracleTags 12c, multitenant, Oracle2 Comments on Multitenant : It’s easy to screw up! I’ve recently been pushing out some videos on this stuff and I’ve got some more already recorded for release while I’m at OOW. Of course, the articles allow you to copy/paste your way through an example, but I think the videos give a more accurate representation of just how simple some of this stuff is from a functional perspective. If you are interested, all the multitenant stuff will be added to this playlist as it is released. Installed the Oracle 12c (12.1.0.2) software. There is an installation article here, but all I had to do was a software-only installation because the OS already met all the prerequisites because of the existing 11.2.0.3 installation. Created an empty CDB instance on the box using “dbca”. Created a new PDB as a remote clone of the non-CDB instance, as described here. Turned off the non-CDB instance. Job done. So far it’s looking good. I’m going to do some messing about tomorrow to make sure it registers with Cloud Control properly and the backup schedule is sorted. Then I’ll give it to the folks to test their apps against. I flippin’ love the remote cloning of non-CDBs. I’ve played with it while writing the article about it, but seeing it happen on a real database was really exciting. I think we all realise that this is version 1.1 of the multitenant architecture. The question is, is version 1.1 good enough at this point? The testing will determine that, not my excitement levels. The testing will be based on our use of the DB. We are a small operation with quite simple needs. If we choose to go this route it will be because it is right for us. Depending on your usage, your experience may be different. If things don’t work out with this POC, we will try with the non-CDB instance. Probably the biggest decision I’ve got to make is “to PDB or not to PDB” *. I mentioned it on Twitter earlier and got some conflicting opinions. I guess the pros and cons of the PDB approach go something like this in my head. The multitenant architecture is the future of Oracle. Depending on which rumours you believe, it’s possible that 12.2 will no longer allow the pre-12c style instances. Putting it off is delaying the inevitable. As long as you only use a single PDB, there is no extra cost. 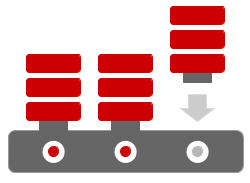 The multitenant architecture has some neat features related to cloning, especially remote clones. That potentially makes provisioning new environments pretty quick. Even with a single PDB per CDB, there are potential advantages regarding patching and upgrades. Caveats apply as always. I’m going to upgrade to a pre-12c style instance first anyway, so I will have a natural fallback position ready to go if I need it. It would be good to invest the time up front to convert stuff now, rather than wait a few years to clean up the mess of CRON jobs and connections using SIDs, rather than services. This choice would force our hand. If some of the technologies we are using are not going to “play well” with the multitenant architecture, I would rather know now than later. Using a PDB is definitely going to break a number of things for us, especially CRON jobs that run scripts using OS authentication. See here. I’m going to upgrade to a pre-12c style instance first, so why add on the extra effort of cloning that to a PDB? Why make life hard for yourself? You can use 12.1 as a half-way house and make the final step later. * I forgot to mention previously, we will almost definitely be going with a single PDB per CDB (the free option) initially. So this is not a “consolidate using multitenant” issue from the outset. When I wrote about the remote cloning of PDBs, I said I would probably be changing some existing articles. Here’s a change I’ve done already. There are also new articles. As I mentioned before, the multitenant option is rounding out nicely in this release.